A 56-year old wife, mother and city manager decided to change her life. Now, her ordained name, Gansho, means constantly learning. How does she as a Western, caucasian, female teacher fare in an American congregation that is 60 percent Asian? Simple, she teaches Buddhism in English. 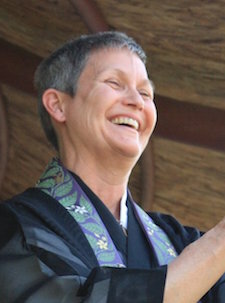 The real barrier, worldwide, is the discrimination against women, and Sensei Carol Gansho O’Dowd is one of a handful of women clergy in the Buddhist Churches of America, a network of 60 Buddhist Jodo Shinshu Japanese temples. Gansho has even established a Buddhist Women’s Association to honor the women who have been the “kitchen ladies” quietly serving the temples for years. Sensei Gansho’s passion is the community – helping everyone tap into the spirit of the community. And, this passion Carol also had when she served as the City Manager of three US cities: Morrison, Snowmass & Aspen, Colorado. She engages in intra- and inter-faith dialogues, and is also a member of the Colorado Association of Psychotherapists. As Minister of the Longmont Buddhist Temple and Assistant Minister of the Tri-State Denver Buddhist Temple, her Buddhist services involve meditation, the burning of incense, a sermon, songs, an altar and statues. Sensei Gansho emphasizes the importance of posture: leaning back resting on the past, leaning forward anticipating the future, she tells her students. Stand straight with dignity in the here and now, with wisdom and compassion.